After showing a series of whimsical looks, today I want to share with you a new and very different outfit. Something very casual, perfect for everyday life whether is going to school or university or going errands. A look played on pearl gray tones, peak color of fall 2016: simple and elegant, perfect for all ages. Here’s an casual look for fall I wore in a break from the shows of Fashion Week in the streets of Paris! I wore a pearl gray coat that I have chosen to pair with a turtleneck sweater of the same color, so clean and essential. Both are made of 100% merino wool and are part of the autumn-winter 2016 collection by Alpha Studio, an Italian brand specialized in knitwear, from Florence, which combines tradition and vanguard. For over thirty years it has been offering models for those who, like me, every day want to wear an item of value and quality. 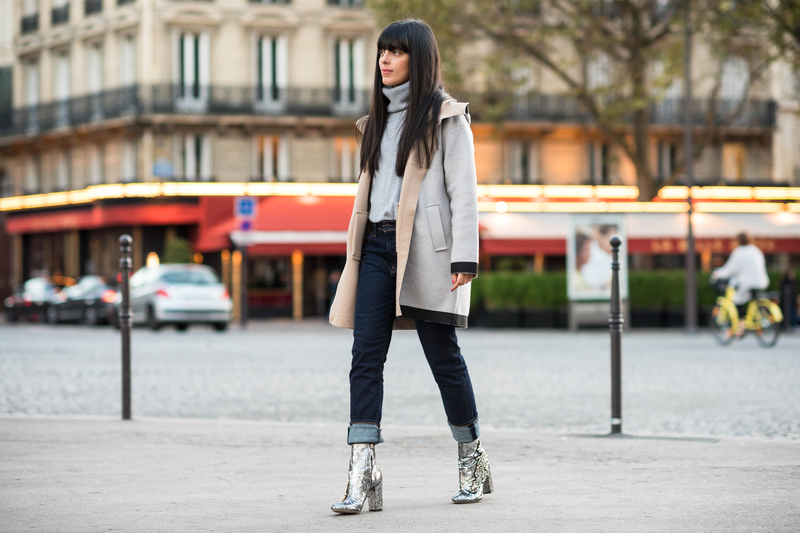 My new favorite pair of jeans and a pair of metallic boots in the shades of gray and silver have completed my casual look for fall! What do you think?